pivot up davits, inflatable boat pivot-up davits and dinghy davits for inflatable boats. The concept behind Dinghy Rings is simple – enjoy your boating life with comfort, style and convenience. Instead of lifting your dinghy aboard, deflating and inflating it or leaving it in the water, Dinghy Rings let you raise your dinghy in an easy and quick way to an upright position. Dinghy Rings is a pivoting dinghy davit, for storing an inflatable dinghy or dinghy at the stern of a pleasure boat, in the harbour or while cruising. The davit is designed to be adjustable, affordable and discreet and is available in 3 versions (FLEX, SLIM and BOLD) to fit sailboats and yachts with external swim platforms, small swim platforms or flat sterns with no swim platforms - especially sailboats when space is limited. FLEX system - best for sailboats and yachts with no swim platform. 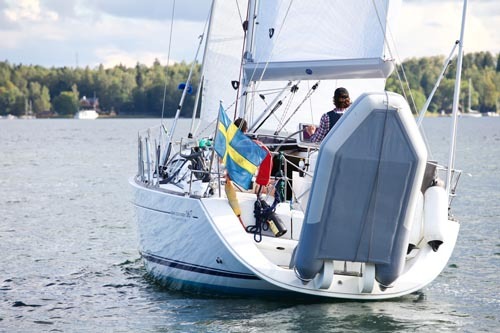 SLIM system - best for sailboats and yachts with narrow external swim platforms. BOLD system - best for sailboats and yachts with wide external swim platforms. Reverse the dinghy astern of your boat, place the rear ends of the dinghy’s pontoons in the rings, secure the dinghy and pull to lift it as the rings rotate. 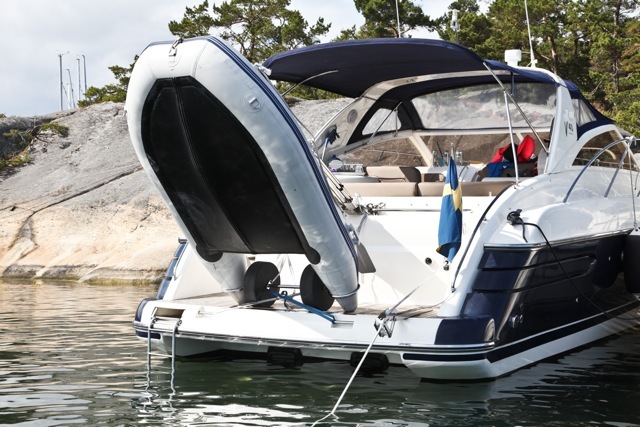 It hoists your inflatable in harbour or while cruising and suits almost any motorboat or sailing yacht. Convenient, easily handled by one person. Gentle to both boat and dinghy. Stable, as the weight is distributed equally. Quick launch in emergency situations. Affordable, thanks to a simple and clever design. When in use the dinghy should not be permitted to take on and hold water. A small engine can be kept mounted under certain circumstances - see below. The prefect solouiton for sailboats and yachts with no swim platform. We make inflatable dinghy storage easier. Review all 3 systems below.